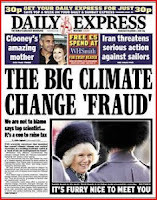 Warning Signs: Why Are Climategate Charlatans Still Free? You're right, Alan, fraud is a crime. In this case a serious felony. 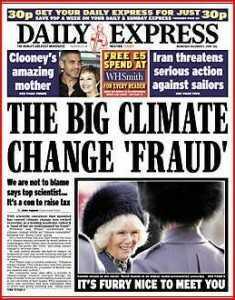 Indeed, why haven't the fraudsters faced "The Man" for their CLIMATEGATE crimes that has cost the taxpayers millions? I think we know the answer - The Global Warming canard the fraudsters advanced was a keystone to the Leftist Green Dogma designed to destroy the Industrial Revolution and send the people of the West back to feudalism, so as to be ruled more easily by the Leftist elite. Thus the fraudsters have been protected by their co-conspirators in the Left from the long arm of the law who know that in a public trial their Green Agenda will be exposed. There is not a politician alive that will admit that he was sold a bill of goods like they bought from the warmists. They will ignore it until it is forgotten and figure no harm no foul. Alan, Booker has highlighted another area, "possible" TERI fraud. I have long suspected Pachauri's TERI was a money laundry for the globalists' NWO fund. That their London branch, a house in S. London suburbs was guilty of false accounting involving £tens of thousands, that Houghton and Tickell were involved, that the charities commission gave them an easy time strongly suggests that the fraud extends far further than CRU, the establishment looks to be in up to its neck in fleecing Joe public. The base in India, recipient of massive funding since Pachauri's rise is reluctant to show its accounts to anyone other than the tax office. Third world tax systems are notorious for their corruption. The accounts of the UN, its cobweb of spin-offs and organisations it supports need to be gone over with a fine tooth comb. That goes double for the EC and its spin-offs now it has been revealed its funding of science was biased to support its credit scam. If the fed res, the BoE, the IMF, the GEF and the IMF ever face accounts scrutiny, what a tale that could tell.